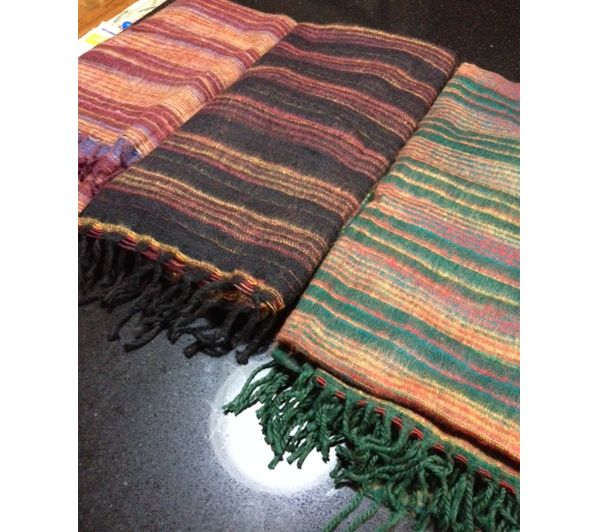 Nepal Project - Yak Blankets - Threshold Academy, Inc. Through the years, people have received Yak Blankets in exchange for donations. The current price is $35 US, plus $9 shipping/2 blankets, if you need them shipped. These blankets are made in small shops in and around the Kathmandu valley, typically by women who make pennies per hour for their labor. They often work in factories without any power or running water and do the fabrication by hand. The wool that the blankets are made of typically consist of yak hair or sheep, depending on availability. For The Nepal Project (TNP), we often receive yak blankets. For us to receive these blankets, someone from Dang has to take an overnight bus right to Kathmandu. This ride can take up to 18 hours, and these buses have neither heating nor air conditioning. Once in Kathmandu, our rider must take a local bus to the part of the city where these blankets are sold. The weary traveler is often bus lagged (like jet lagged, but more uncomfortable), dehydrated and hungry. They navigate this district of Kathmandu and find a shopkeeper willing to extend a deep discount on a bulk purchase of blankets. After lengthy negotiations that includes the consumption of tea and the exchange and pleasantries, the blankets are purchases and wrapped in a plastic bag and pillow case for shipment to the US. There are typically no cardboard boxes available for shipping. At some point, I receive an email asking me (again) for our mailing address, and the address is written in marker on the outside of the pillowcase. The pillowcase is then tied closed and taken to an international shipment station, where it is weighed and a customs declaration is done. The blankets travel via overland, sea and air to arrive in the US. They are then delivered via USPS to our home, where we open the pillowcase with a pair of scissors and set the blankets aside for distribution. The difference between the cost of the blankets and the amount that you buy them for is used to pay for direct and indirect costs associated with building and staffing schools in the Dang Valley of Nepal. These proceeds change lives.